Why do we need the Discovery Centre? With around 360,000 annual visitors, the nature reserve needs a larger facility to engage with people, as well as decent office space and storage for staff and volunteers. What educational facilities will be provided? An important improvement will be flexible space for school parties and other educational groups. This will include separate toilet facilities and storage. For some time, reserve staff have been developing learning areas in four main habitats close to the Discovery Centre, where students will have direct contact with wildlife. This space can also accommodate meetings and lectures. Exhibitions will explain the importance of the reserve to all visitors. Construction commenced mid March 2019. The building should be up and running in late 2019. The formal opening of the building is planned for April 2020, the 50th Anniversary of the Nature Reserve. The site at Lime Kiln Cottage has none of the international wildlife designations of the surrounding land. 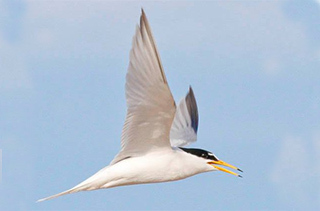 It has good views over special wildlife habitats and is close to four activity areas for educational groups: grassland, saltmarsh, shoreline and a birdwatching hide. In 2017, 220,000 visitors entered the reserve by walking past this location. What green features are incorporated? The building will be made with locally sourced sweet chestnut cladding. The design includes photovoltaic panels covering half the roof. The building and surrounding landscaping will provide many places for wild plants and animals to live. The ventilation will be passive and the heating will utilise air sourced heat pumps. Who will run the Discovery Centre? Sussex Wildlife Trust will manage the building and its operation. 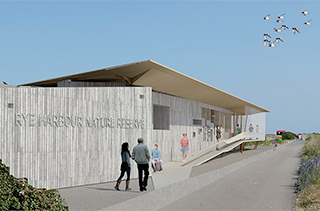 The Friends of Rye Harbour Nature Reserve will support the running of the building. 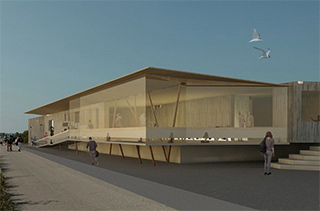 It will provide a warm and comfortable space, offering information, toilets, refreshments and a view, so people and educational groups can plan their visits in all weathers, all year round. This is especially important for visitors who have mobility challenges. It will enable people of all ages and abilities to discover more through increased numbers of educational visits, events, adult education, work experience, training, displays and interactive exhibits. It will improve the visitor experience and encourage year-round, repeat visits that will also benefit local tourism businesses. The building cost will around £2.5m but the total project cost is around £4m. Where will the money come from and how much has been raised? So far (mid April 2019), the total public fundraising appeal now stands at just over £234,000. Funds raised from Trusts, Foundations and public funding stands at £1,305,450, taking the total to £1,539,600. The Friends of Rye Harbour Nature Reserve has pledged £1.8m, mostly a generous legacy from David and Joyce Layton. So the current figure raised is £3,339,633. The site is irregular and the design must fulfil a number of requirements to make it suitable. The floor level has to be raised 1.2m to be flood resilient; it has to be wheelchair accessible, there needs to be provision for toilets and a café; lighting levels have to be low and, as far as possible, it has to be energy-neutral. More importantly, the surrounding land has the highest of wildlife designations, so the construction programme has to be contained within a small, confined area to ensure there is no impact on the wildlife surrounding it. Yes, four, wheelchair accessible toilets. In addition, there will be three separate toilets for the use of educational groups. Wheelchair access to the building will be via ramps to the front and rear entrances. What provision for sewage disposal? The building will be connected to the main sewer. A cafe will serve a menu of hot and cold drinks, cake, biscuits and simple hot food such as sandwiches and soup. The kitchen will enable the space to be used for events. Will the cafe conflict with local businesses? The range of refreshment on offer will be limited to avoid any competition with the existing businesses of Rye Harbour, which offer full catering, breakfasts and hot meals more than 600 metres away. We believe that Discovery Centre will be a major additional benefit to what the nature reserve already contributes to the local economy, especially the local tourism businesses. We already promote the local businesses that provide fuller menus, and will carry on doing so once the new Centre is open. How can I get a better idea of the size? The Discovery Centre will occupy all of the land where Lime Kiln Cottage stood. Why didn't you carry on with Lime Kiln Cottage? Lime Kiln Cottage was cramped, damp, cold and liable to flooding, last time in 2013. It was a poor place for volunteers, had no toilets and didn’t provide space for school groups, meaning education had to take place outdoors, in all weathers. Aren’t you worried about vandalism? This is a concern for such a remote building, but security surveillance will be installed.